Every living thing or person requires certain ingredients in order to grow, and if a thing or person is not growing, it is dying. What is true in the physical realm is also true in the spiritual arena. In order to grow spiritually, individual Christians, and the whole Church in fact needs certain fundamental ingredients. The Acts of the Apostles is a book that is all about growth. Will Vaus has been meditating and preaching on Acts for many years. In this volume, he offers the reader forty-one keys from the entire book of Acts to unlock spiritual growth in everyday life. 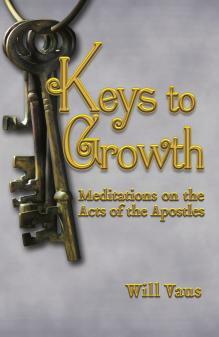 In his book, Keys to Growth, Meditations on the Acts of the Apostles, Vaus has given a timely gift to all students of Luke’s second New Testament book. A rich feast awaits those who think they already have the clues necessary to understand how Jesus taught his disciples to be effective witnesses to the Good News. From many years of study and preaching from this pivotal book, the author throws open new windows of insight to its wisdom and truth. READ IT! Author of The Divine Expedition: Where Are You in the Book of Romans?